ELIZABETH CITY, NC ––The 2016 Chevrolet Malibu Limited has everything you would expect and beyond in a midsize sedan. All-around balance of excellence is what makes driving the Malibu Limited an experience to remember. 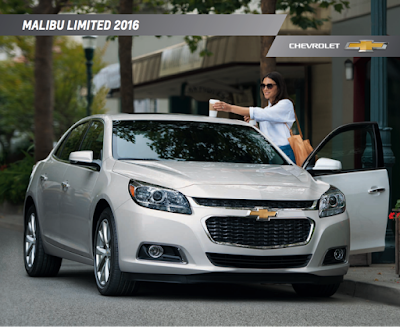 Learn more by downloading the 2016 Chevrolet Malibu Limited brochure. The 2016 Chevrolet Malibu has undeniable good looks with sculpted dynamic lines, a chrome accented grille, and an interior that feels like a resort but looks aren’t everything. Superior smoothness and quiet in ride is from the finely tuned independent suspension and liquid-applied sound deadeners and triple door seals. Chevrolet delivers on performance, connectivity, and safety in the 2016 Malibu Limited. Standard available OnStar built-in 4G LTE Wi-Fi and Siri eyes free allow you to stay reliably connected on the road. The 2016 Malibu Limited delivers strength at 197Hp with its standard 2.5L 4-cylinder engine. Continuously Variable Valve Timing and Direct Injection lends to an EPA-estimated 34 MPG highway. The Malibu Limited has a five-star overall vehicle score for safety from the National Highway Traffic Safety Administration. The incredible safety features include the strong steel structure, 10 air bags, rear cross traffic alert, Side Blind Zone Alert, available lane departure warning, Stabilitrak electronic stability control system, and forward collision alert. To see all the incredible features and details, download the 2016 Chevrolet Malibu Limited brochure. If a midsize that has it all is what you want, stop by Perry Auto Group to purchase or lease your 2016 Chevrolet Malibu Limited. Perry Auto Group has two dealership locations to serve you better at 1005 W. Ehringhaus St, Elizabeth City, NC, 27909 or 1001 Halstead Blvd Elizabeth City, NC 27909. Stop in for any of your auto or community needs, or feel free to give us a call at (252) 338-9100.